Review is a major foundation stone learning new complicated skills and developing great ability in any sphere. The quality of review makes the all difference in how fast your child moves on to new pieces. • What do you do when children say they don’t want to play the “baby” pieces and want to rush on to the new pieces? • Can you get your kids totally engaged and focused on what really needs to be done, without loosing your cool? • How do you create a brand new learning experience, for violin and viola students, where the brain is engaged? • How can teachers and parents communicate so that they know exactly what needs to be practiced? • Just HOW do you make review FUN for young violin and viola players? ✓ Review – Making it Fun, Gets the Job Done shows you how to make review fascinating and productive, by engaging kids with fun focus ideas. ✓ Review – Making it Fun, Gets the Job Done will help you discover how to get more from your kids. When WORK is FUN your kids are motivated and their review skills quickly improve. ✓ Review – Making it Fun, Gets the Job Done is a must for busy teachers and parents who are struggling daily, to get kids to work at the pieces, they think they know already. 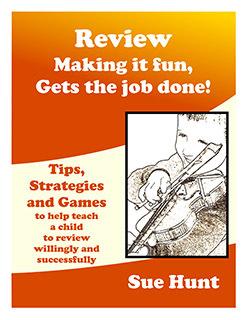 ✓ Review – Making it Fun, Gets the Job Done has review cards for violin books 1 – 3 for you to customise for your child. ✓ Review – Making it Fun, Gets the Job Done contains cards with notes on review focus points for each piece. ✓ Review – Making it Fun, Gets the Job Done includes tips on how to review Twinkle and Perpetual Motion for technique and focus. ✓ Review – Making it Fun, Gets the Job Done presents its own unique Review Challenge: Mini Focus Cards for violin books 1 – 3, with one focus point on each, spare sheets for you to make your own cards and a sheet of Challenge Cards for each book.